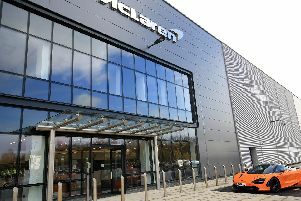 X-Cel's factory on the Advanced Manufacturing Park is opposite McLaren. A Sheffield machining company is set to move all its operations to Rotherham - and hire 20 - under plans for a £2.5m extension and new building. X-Cel Superturn will expand on the booming Advanced Manufacturing Park where it is neighbours with Rolls-Royce and McLaren. The 100-strong firm, which specialises in machined components, has bounced back with its best three months in the last two-and-a-half years. It made a loss last year due to the downturn in oil and gas. Now it plans to build an extension and construct a new building at its site on Brindley Way, set to open next year. Bosses say they are creating up to 20 jobs in areas including coating, machining and quality, and sending apprentices to the AMRC Training Centre, which is just down the road. Group commercial director David Barton-Phillips said they planned to close the headquarters on Atlas Way, Attercliffe, and sell the site in a bid for greater efficiency. The firm moved its gasket and seals department to the AMP in 2012. He added: “We have run quite a complex business on two sites which has been a waste of resources. We’ll all be on one site and one system in the future which will make our products less expensive. “There were a lot of companies which suffered in the downturn and a lot of very big companies went out of business. “We reported a loss last year, but it was less than expected. We diversified into areas including marine and now we’re looking at growth. The oil and gas sector was coming back and the company had also diversified into areas such as marine. The extension and new build will give the firm nearly 100,000 sq ft of manufacturing space. By end of 2018, its coating capacity will triple and it will have an extra capacity of 38,000 machining hours per year. The business was founded by Andrew Taylor in 1984 to manufacture small to medium CNC machined parts, with its first base being Wadsley Bridge near Sheffield. He is still at the helm today. In 2011, the firm bought H.T Precision of Batley,specialists in CNC machined parts for UK valve manufacturers. A year later it moved to larger premises on the outskirts of the town.